When did you start wearing your baby/young child? The first time I wore my older son was when he was about two months, and I had a crotch-dangler from my registry. I wore him so I could walk our dogs at night. He didn’t like it very much so I did not use it that often. It wasn’t until he was older, and I found out about carriers with proper hip placement that I asked for a Boba for his first birthday and was a babywearing mama from then on! What is your favorite carrier? 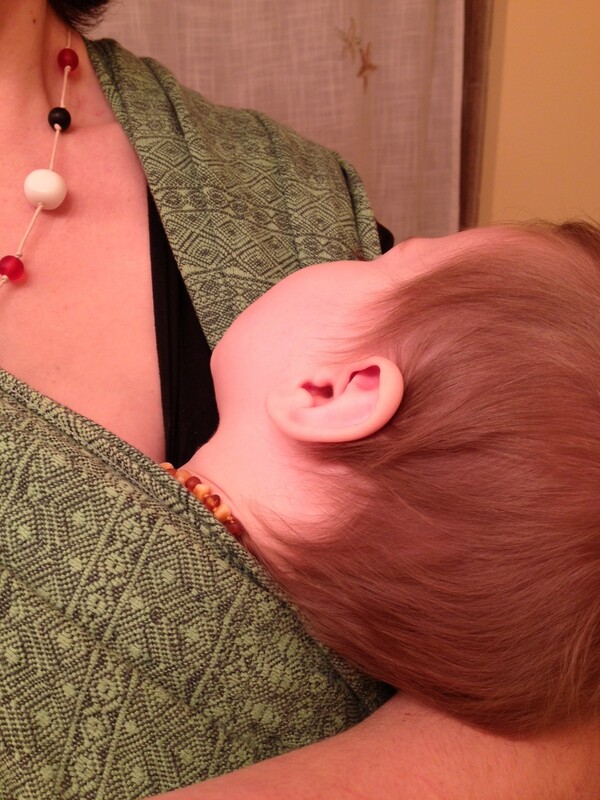 My current favorite is my Didymos Goldfishe wrap. It is a size 4 and I love that I can do a quick back wrap or hip carry or kangaroo with Little #2 and he just settles right into it. What is your favorite carry? 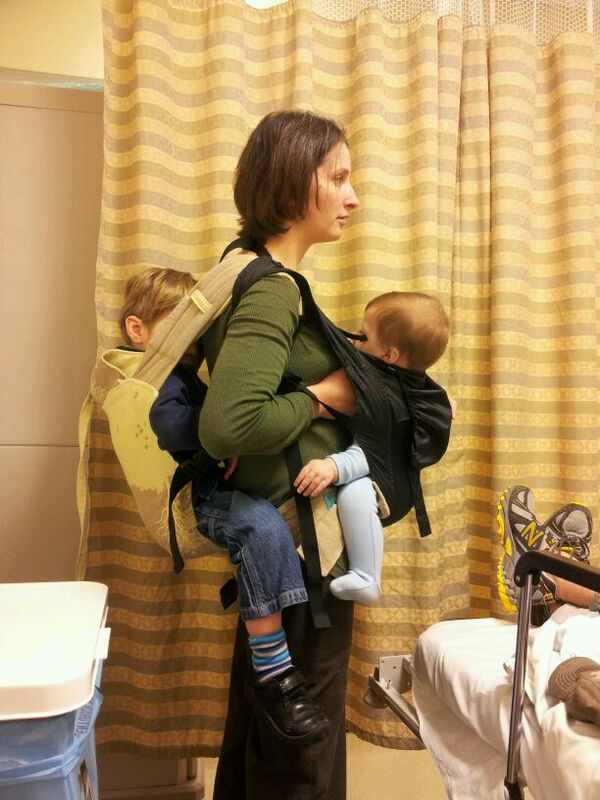 I usually use the front carry with my 5 month old and then either hip or back with my 2.5 year old. 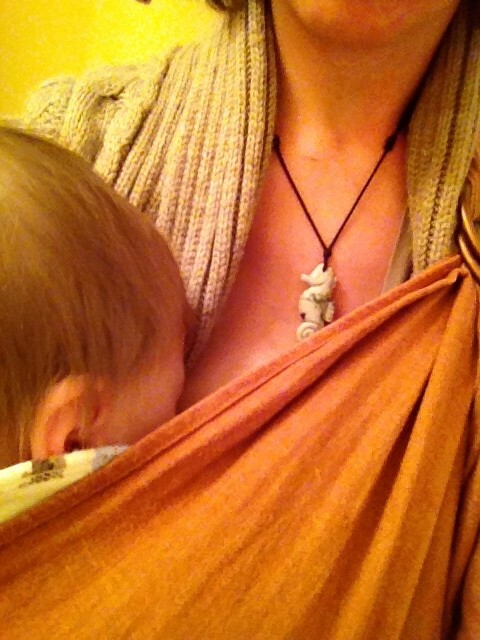 I am most impressed with myself when I am able to breastfeed while my child is in the carrier. 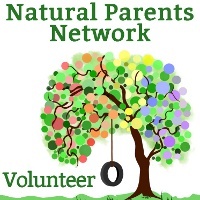 Do you have a favorite babywearing story/scenario? The other day actually I managed to tandem babywear my toddler on my back in the Boba 2G and my infant on the front in my Baby K’tan. My friend called me a rockstar for pulling it off. What is the strangest or funniest thing you’ve done while wearing your baby? My neighbors think I’m a little crazy because I babywear while walking the two dogs. I usually have the infant on me, my toddler in the stroller and the dogs on the double leash. I also had to babywear while using the bathroom in the airport. What is your favorite thing about wearing your baby? I really can go anywhere. I can nurse discretely. I can follow a toddler through a playscape without worrying my stroller might get lost. I can cross busy streets without having to drag or chase my toddler. I have my hands free for other things and I know my child is safe. 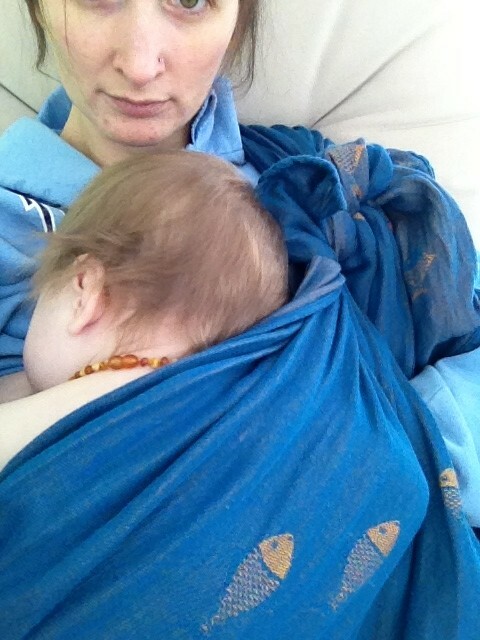 I credit babywearing while skin to skin with my youngest for improving our early breastfeeding relationship. 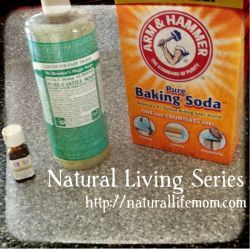 Shannon writes at The Artful Mama and is a wife and mother to two amazing little boys. 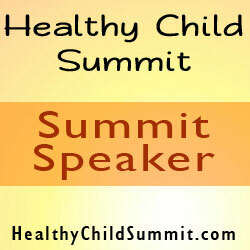 She is a high school art teacher, cloth diaper consultant, babywearing addict and doula. You can find her on Facebook and Twitter as The ArtsyMama or in her Cloth Diapering Consultant role at Diaper Parties by Shannon on Facebook and Twitter. 3 Responses to "Babywearing Mama Profile – Shannon"
I am beyond envious of your collection, Shannon! I’m dying to know how you pulled off carrying both kiddos. Which did you put on first? I put both carriers on my waist first and had the back one on under the front belt. I put Little Man on in the back first and secured him before I put Little #2 on in the front.